Egypt is a country that has captured the imagination of travelers all around the world, where ancient temples are juxtaposed against apartment blocks and the roads are shared between cars and camels. There’s nowhere quite like it. While many people make the trip just to Cairo for the pyramids — and yes the pyramids are amazing and yes I cried when I saw them and you might too — if you don’t head further South, you’re missing out on some of the most incredible examples of ancient Egyptian art, architecture, and history. 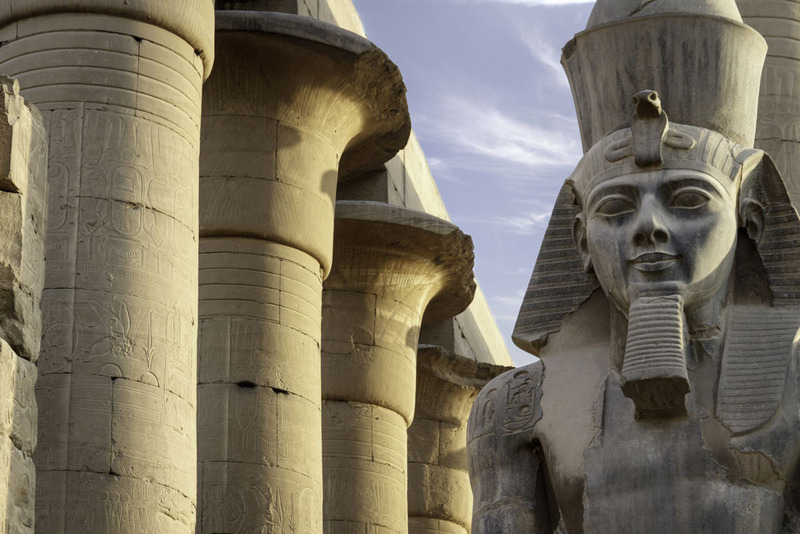 If Egypt is on your bucket list because ancient history gets you all riled up, Luxor, Egypt, will blow your mind. The modern-day city is built on the same land as the ancient city of Thebes, which, together with its necropolis on the other side of the river, is a UNESCO World Heritage Site that will take you days to explore in its entirety. 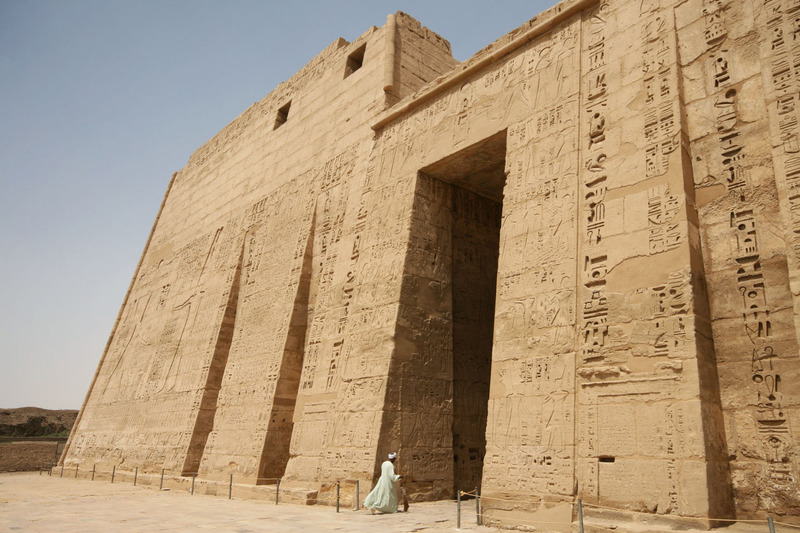 You can find lots of information online about exploring the sites within the city limits, which include sites like Karnak Temple and Luxor Temple in Luxor, Egypt. It’s also easy to get a tour to take you to the West Bank where the Necropolis of Thebes is located. 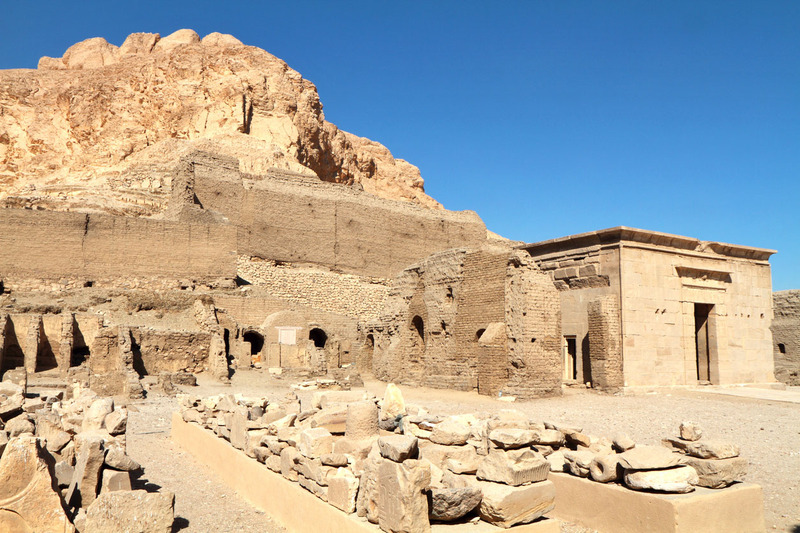 The whole area along the river is dotted with different temples and burial sites from the various rulers of the New Kingdom, which included the most famous pharaohs in Egypt’s history. 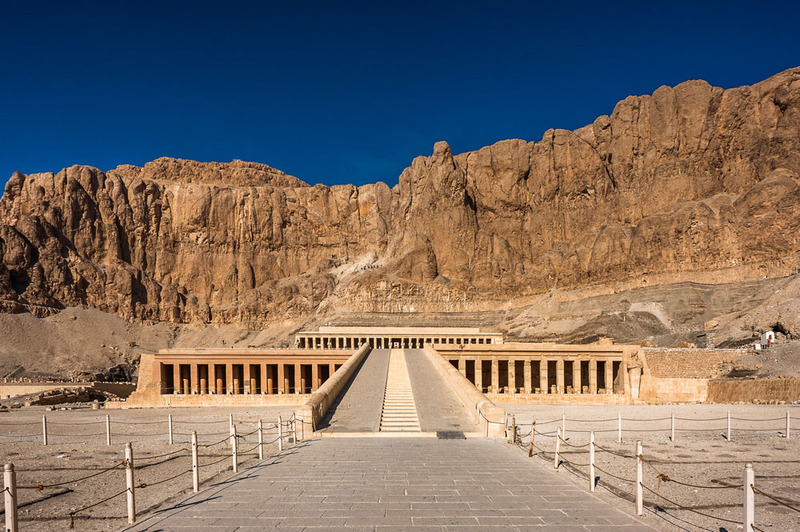 The tours all follow a set route, which takes you to see the Colossi of Memnon, the Mortuary Temple of Ramesses III at Medinet Habu, the Mortuary Temple of Hatshepsut (the badass lady pharaoh of Thebes), and ends with the Valley of the Kings. I recommend going on this tour; it’s a great way to get your West Bank bearings and learn a lot of interesting information about the history and creators of each site. For an epic experience, you can splurge and take a hot air balloon ride over the Valley of the Kings. 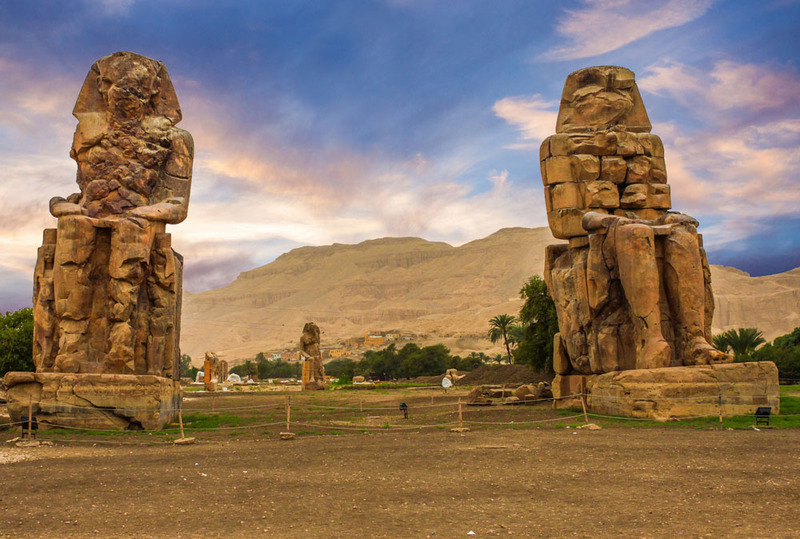 Colossi of Memnon, Luxor, Egypt. But if you don’t get off the tourist track, you’ll miss some of the most unique and underrated burial sites in Egypt: the Tombs of the Nobles and the Valley of the Artisans. Just over the hill from Hatshepsut’s Temple are the Tombs of the Nobles, the final resting place of many of the Theban upper class. While the Valley of the Kings is amazing in its scale and the grandeur of the tombs of the pharaohs, the Tombs of the Nobles show a different and more human side of ancient Egypt. The tombs in this area are all wildly different from one another in style and architecture, but they all show scenes from daily life in ancient Egypt with immaculately preserved colors that were unlike anywhere else I saw. You can see regular people living their lives on those walls: farming, hunting, getting their hair cut, and feasting, endlessly feasting. It humanizes the fantastic world of the ancient Egyptians. Mortuary Temple of Hatshepsut, Luxor, Egypt. Because most tour groups don’t come here, when I visited I had the entire place pretty much to myself. The guards had to come and unlock each door to let me in since they received so few visitors. It was amazing being able to take in so much history by myself and take my time exploring and examining the detailed carvings and paintings. Typically the few tourists who come to visit see the three tombs of Ramose, Userhet, and Khaemet, because they’re centrally located and all on one ticket. The tomb of Ramose is especially famous because it has a hypostyle hall as a part of its tomb which is cool, but if you were going to skip one of the tickets, I’d skip this one. Mortuary Temple of Ramesses III at Medinet Habu, Luxor, Egypt. Another ticket gets you in to see the tombs of Sennofer and Rekhmire. Rekhmire’s tomb has art depicting exotic animals being brought as tribute and a really unique, never-seen-anything-like-it architectural style leading dramatically up to a false gate to guide Rekhmire’s spirit to the next life. Rekhmire’s ticket buddy, Sennefer, is completely different. You have to crouch through narrow passageways and follow a steep staircase down into the earth and when you arrive in the tomb you’ve been transported to a completely different world. The ceilings follow the natural shape of the earth and are covered in brightly patterned designs and grapes, so many grapes that the tomb is famous for it. 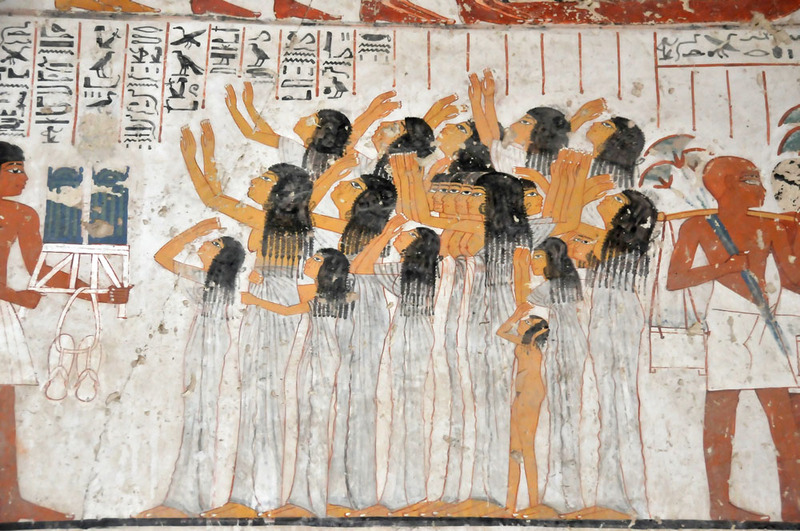 Paintings in the tomb of Ramose, Luxor, Egypt. The last ticket gets you into the tombs of Nakht, Menna, and Amenemopet. While the first two have some really amazing paintings, I’m not gonna lie, Amenemopet’s tomb was the first site in Egypt that made me cry. The weight of the history of the room was overwhelming and he built a beautiful monument to his wife in his tomb that just undid me. Carvings at the necropolis of the nobles, Luxor, Egypt. The other site you don’t want to miss is Deir el-Medina, the Valley of the Artisans in Luxor, Egypt. It’s a combination village/necropolis/temple where the workers who built the tombs of the pharaohs and nobles lived and constructed their own tombs in their free time. Your ticket gets you into the three tombs (or four if you make friends with the archeologists) which are open to the public and they have some of the most well-preserved paintings in all of Egypt. They’re also, because the artists constructed them, high quality and have some really unique art. One of the tombs has the most unique depiction of Nut, the sky goddess who eats the sun each night and births it each day, that exists. The Ptolemaic Temple of Hathor at Deir el-Medina, Luxor, Egypt. 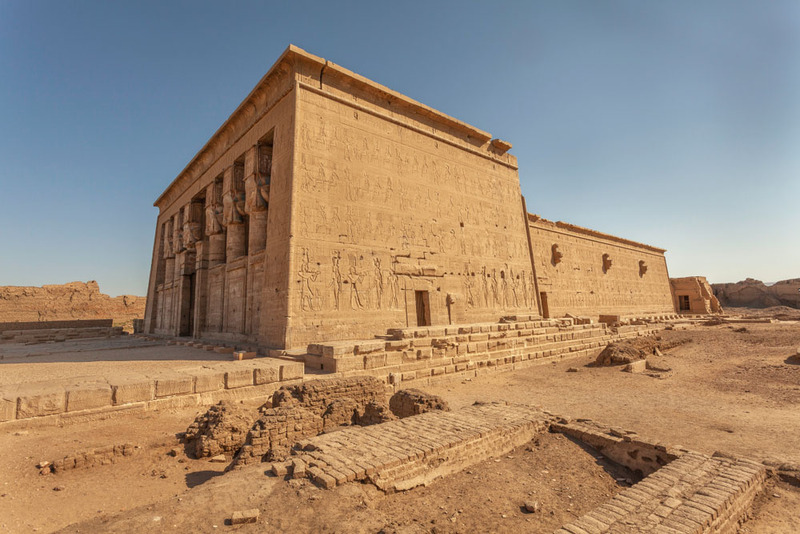 On the far side of the complex is the Temple of Hathor, the cow goddess of music, joy, love, and motherhood, and from the valley side, where the tombs are, you can also look over the ruins of the village itself. 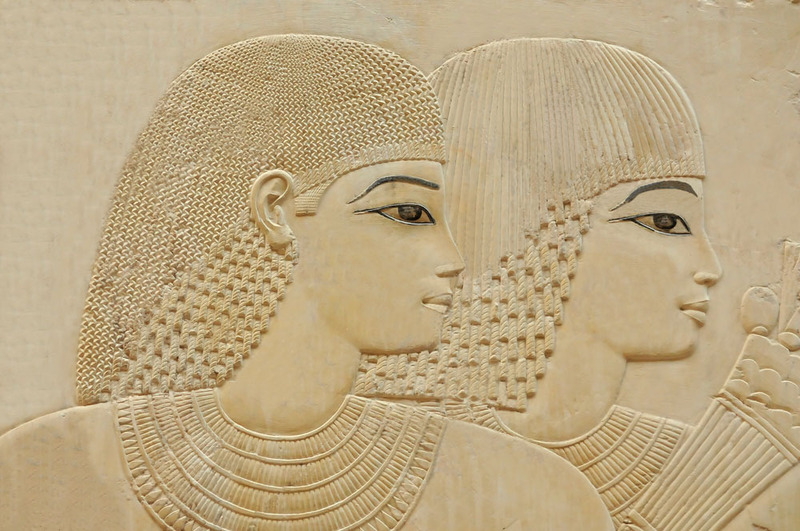 This site is where most of the information about women’s daily life in ancient Egypt has been learned through artifacts and letters and you can see a lot of goods from here at the archeological museums in Luxor and Cairo. Temple of Hathor, Dendera, Egypt. There’s nowhere else in Luxor, Egypt, where you can really imagine what it was like to live and work in the ancient world, like Deir el-Medina and the Tombs of the Nobles. They’re easy to miss because locals typically only try to sell you on the main sights, but now that you know they exist, add them to your bucket list! Once you’ve checked them off you’ll be one of very few people, and fewer Westerners, alive today who have seen these sights. 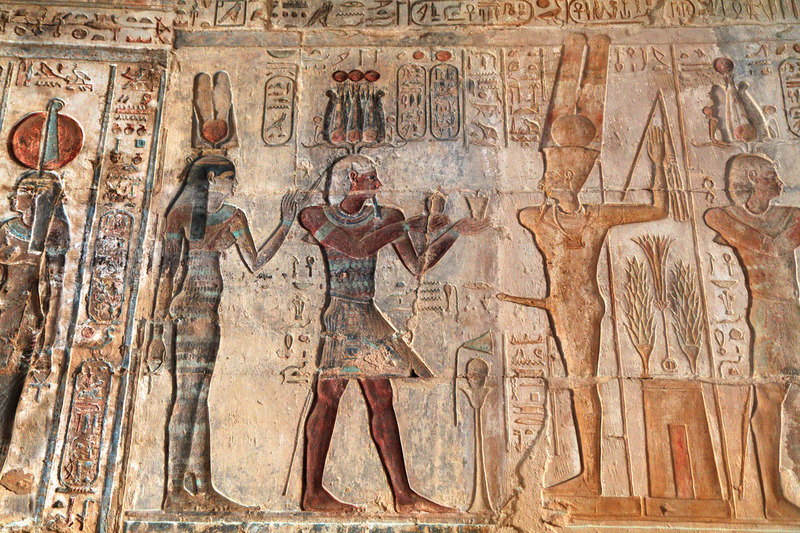 Paintings at the Ptolemaic Temple of Hathor at Deir el-Medina, Luxor, Egypt. Pro Tip: When traveling to Luxor, Egypt, bring lots of small bills with you. One of the most frustrating aspects of traveling in Egypt is the tipping culture. If the gatekeeper of the tomb you go into starts talking to you about what is inside, he’ll expect a tip. If you give small amounts, like 5 or 10 EGP, you’re less likely to get hassled for more money than if you give a larger tip. If you don’t want their assistance, tell them no thank you. Be firm. On the other hand, if you want to take photos you can typically get away with offering some baksheesh if there’s no one else in the tomb!